Carpenters & Joiners in Bradford, BD6 2NN. Covering Bradford and all surrounding areas. CDE Joinery & Electrical Solutions is a well established, trustworthy, reliable and professional company with over 20 years experience. Based in Bradford, we cover Bradford and all surrounding areas. We guarantee a clean and tidy service and consider no job as too big or too small. We are proud of our reputation with previous customers for our high standards in both standards of work and customer care. We can work to your own designs and ideas, which combined with our expertise, will guarantee that your final result will be high quality, and we find from our previous customers' feedback, frequently admired and commented on. We give free, non obligatory quotes and estimates and can provide other services not listed above. If there is something that you require that is not in the above list, please call us as we are always happy to be available for free professional, friendly and helpful advice. We look forward to hearing from you. "Through booked through John Lewis, and so price is irrelevant, he was extremely polite, clean and detailed in his work. Would highly recommend him to anyone"
"Chris did some work for us on our new build and really did an amazing job! He made us some units in the living room from MDF based on an idea we had seen online. 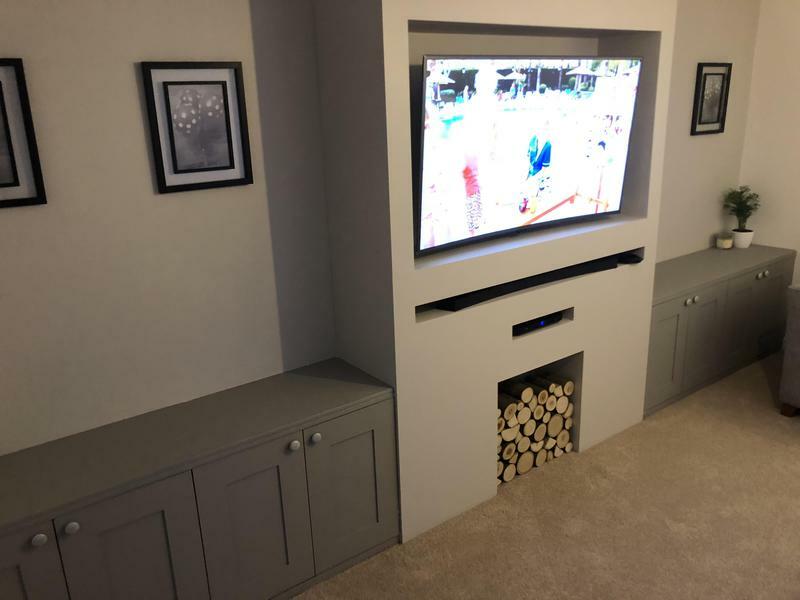 He achieved exactly what we wanted and more, giving us tips on how we could improve on the design and then built and installed the units which have completely transformed the living room! He came round first to measure and talk through some final points and was always here when he said he would be and worked really hard to get everything done as quickly as possible. He also made us some built in sliding glass wardrobes in 2 bedrooms with internal storage which were really well built and high quality. Would definitely recommend Chris for all your joinery needs!" "Chris did a fine job and went above and beyond to do the work on Mother's Day! Just replaced a few floorboards but took the time to do it properly. We'll definitely want to put more work his way in future." "Having been let down by three or four "joiners" I managed to get hold of Chris. He answered my initial text immediately and gave me a quote for the job via text ( I only wanted nine internal doors hanging so he didn't need to look at the job). That said these were solid oak doors which is what I think put others off. Chris offered to come round anyway to introduce himself and look at the job. He turned up when he said he was going to. He even brought the start date of the job forward which was beneficial to us. On the day of the job he was here on time and worked all day, same goes for the second day. His workmanship is absolutely top notch. All the doors are a perfect fit and his skills are the best I have seen. He is a polite and trustworthy workman. He is very tidy in that we had nothing to clean up when he had finished. I already have him lined up to do more jobs. You won't go far wrong getting Chris to do your joinery work. Top class."